Peak District from Warwickshire is via the M1 with our usual "get off" point being Exit 29 near Chesterfield. From here it is a short drive to most of the areas we favour. The nearest of these is the car park adjacent to the Robin Hood pub on the Chesterfield/Baslow Road and it was here where we parked when we did the Eastern Edges between Baslow and the Longshaw Estate. this we walked a few yards along the road towards Curbar before turning off right to take a path that would lead us on to White Edge. 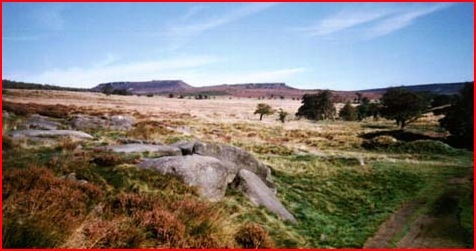 White Edge, and indeed most of the Eastern Edges are more akin to the Dark Peak than the White Peak, although they are on the O.S. White Peak Map. The Peak District was once described to me as a big saucer with the inside being the White Peak and the generally more upland areas, the Dark Peak, being the rim of the saucer. We were on the eastern rim and so for the next hour or so we enjoyed a peaty track and scenery that was very reminiscent of Kinder Scout. ‘Twas definitely Dark Peak country and even more so because of the rain that it had received in the previous few days which had made some parts of our path very boggy. But nevertheless we enjoyed the desolatness of this terrain and met very few people, which was probably good as Larry was in a very boisterous mood. Before elevenses - on walks like this a small flask of black coffee and a Snickers are becoming an essential for mid morning breaks - we were reminiscing about music we liked etc. Needless to say it wasn’t long before Ray and I were talking about Dean Friedman concerts we had been to while the other three didn’t know who we were taking about. The odd verse was being sung of some Beatles’ melodies and then Larry made an amazing revelation. It seems the only song he had ever known the words to was My boomerang won’t come back by Charlie Drake. Wow, we were impressed. So impressed that we encouraged him to sing it to us, complete with all the funny voices and by he time we left White Edge we were having a go too. Did you know that if you want your boomerang to come back first you have to throw it? Seems Charlie Drake never thought of that. Just before leaving White Edge we spotted the Grouse Inn on our left (west) and were in agreement that it should be our lunch stop. Once off White Edge our route took us through the Longshaw Estate, which is owned by the National Trust, and although I can’t say I’ve really explored the estate I have walked through it many times. 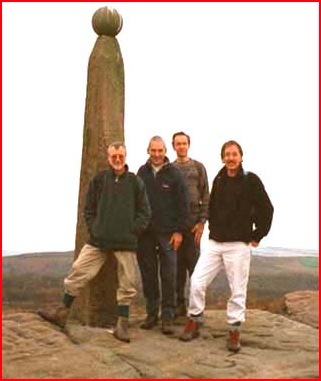 The estate's car park is an ideal starting point not only for areas on our route but also for ridges to the north and Higger Tor and Carl Wark. But today we were not going to venture further north. 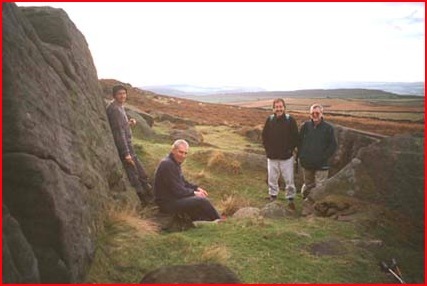 The "Boys" had heard me talk about Padley Gorge and were quite eager to follow it down to Grindleford. I must admit I was less keen as I knew that having reached Grindleford it would be a damn hard slog uphill to get to the Grouse Inn. However a democratic decision was made and we walked through the woodland that covers the slopes of Padley Gorge down to Grindleford. At the bottom we were tempted to sample a drink at the Grindleford Station Café (licensed) but resisted the urge. It was now uphill. The first part of the route was easy to find but it became less obvious as we went further up the hillside but our navigation was ok and we reached the A625 a 100 or so yards north of the Grouse Inn. As I write this it is the only visit I have made to "the Grouse" but we were all very happy with the welcome, the food and the drink. Most of us had steak and kidney pie with all the trimmings. Delicious. We also had a couple of pints except Larry who was concerned about ensuring his alcoholic level was sufficient to get him through the rest of the walk. He was on his second pint before the rest of us had hardly tasted our first. Maybe he was dry from his renditions of My boomerang won’t come back. Lunch over, we now were going to enjoy Froggat, Curbar and Baslow Edges. 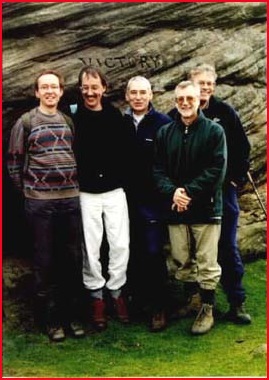 It was therefore out of the pub, down the road and soon we were taking the footpath on to Froggat Edge. I love these edges. 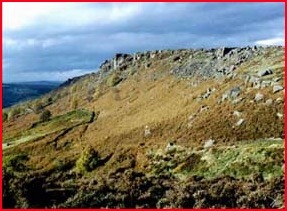 The walking is fairly easy, although it gets more rugged as you reach Curbar Edge, and the views westwards are superb. Needless to say we took opportunities to take a few more photos. Eagle Stone is supposed to be magical. Not only is it supposed to turn slightly every night but all the men of Baslow are required to climb it before they can get married, or something similar. None of us attempted it. A surfeit of beer and steak and kidney pie was not a suitable training diet. 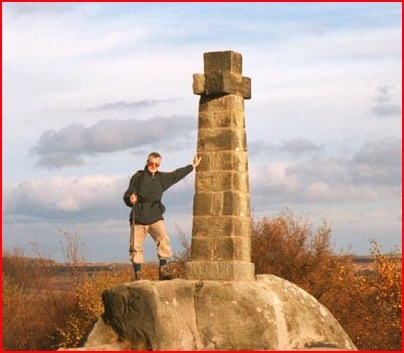 So we moved on and rested on the seat next to the Wellington Monument and enjoyed the views and were able to see the Nelson Monument and Birchen Edge to the east-south-east. If you want to find out more about these monuments and Eagle Stone some information can be found on the Derbyshire Guide Website, along with a short walk on Baslow Edge, at www.derbyshireguide.co.uk/travel/walks/baslow.htm. We next took the path towards Baslow but immediately before the first gate is reached there is a path, which goes off left and passes under the Wellington Monument, which we followed to the Sheffield/Baslow Road. If the reader should want to use this path you should be aware that whenever I have used it it has always been overgrown and usually very muddy. In fact after rain it can be a real quagmire. On reaching the road there is a cottage opposite, with a water trough adjacent and right by this is the uphill path we needed to take. 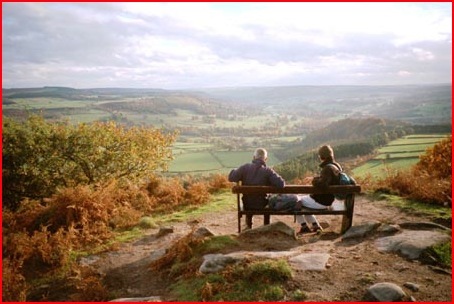 This area is called Gardom’s Edge and as you get higher up the path you are treated to wonderful views of the Chatsworth Estate, which lies to the south. This is a lovely path to walk. It’s not too steep; it’s well drained and enough rocks and trees to make it interesting. On reaching the crest of the ridge it was a gentle stroll to reach Robin Hood and our transport home and the end of a very enjoyable day. The total distance covered on this route would be about 15 miles, although it could be shortened by missing out Padley Gorge and Grindleford.